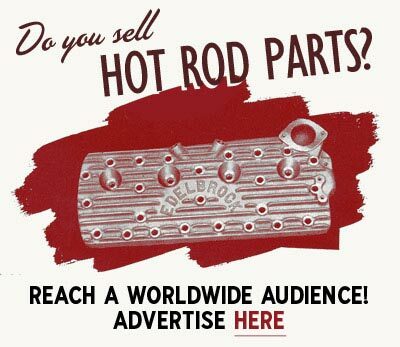 Are you looking for the whereabouts of your old hot rod or custom? Or are you looking for info on an old car you have found? Send us an email at mail@kustomrama.com with some photos and information and we will add the car to our lost and found section. With hundreds of enthusiasts from all over the world stopping by each day, chances are that someone could help you out with leads or information. Looking for info: Thomas Dannerbauer's 1929 Ford Thomas Dannerbauer of Bayern, Germany recently purchased an old Hot Rod from Lodi, California. Little of the history is known about Tom's roadster. It shows traces of several stages of being hot rodder throughout the years. It has been parked since the 1980's and the known history is long gone. Looking for Info: The New York Mystery Sport Custom US built Sport Custom, currently located in Italy. The car was purchased in New York in the late 1980s or early 1990s. The buyer found it for sale on Hemmings, and all he remembers about the guy he got it off was that he was a physician in the Syracuse, New York area. Looking for Info: Don Ellis' 1955 Ford Thunderbird Dennis Bradford's 1955 Ford Thunderbird custom was featured in the June 1959 issue of Rod & Custom Magazine. The story was named "Trimmed with Taste," and the author of the story compared the appearance of the car with the appearance of a limited production vehicle such as the Facel Vega. Lost: Dean Jeffries' 1947 Mercury In 1957 Dean Jeffries sold his heavily decorated 1947 Mercury convertible to Jerry Halak of Toledo, Ohio. A year later Halak sold it to Larry Nadrasik. Nadrasik later moved to England, and rumor has it that he brought the Merc along. Looking for Info: Pascal Bandelier's 1932 Ford Cabriolet Calling Texas! We need your help identifying this survivor 1932 Ford. Currently owned by Cheaters car club member Pascal Bandelier of Geneva, Switzerland, the car has roots back to Texas where it was dragged out of a barn sometime around 2002. Update: 1962 Ford Cougar 406 Great news everyone! We just received another lead in our hunt for the lost 1962 Ford Cougar 406. The Cougar 406 is a concept car built by Dean Jeffries for Ford Motor Company. We first ran the Cougar in our Lost & Found Section back in 2016, after receiving an email from Mike Nottingham of Richmond, Indiana. Looking for Info: Mike Fasulo's 1936 Ford Club Cabriolet Mike Fasulo's 1936 Ford Club Cabriolet is one of the Early Styled Customs that have signed up for the 5th annual Kustomrama Custom by the Sea car show in Wildwood, New Jersey. Mike bought the old custom as a non-running project last year. He believes it was built back in the 1950s, but his research ends at the Hersey Swap Meet back in the 1980s or the 1990s, where it was bought by New England drag racer Buddy George. Looking for Info: Allan Fielding's 1932 Ford 5-Window Coupe 1932 Ford 5-Window Coupe owned by Allan Fielding of Burriville, Rhode Island. Allan traded a 1951 Oldsmobile for the coupe around 1955. It had already been hot rodded when Allan got it, and the coupe ran a channeled 1932 Ford chassis. The driveline was missing. In January of 2018 Eli English of Traditional Speed and Custom in Pittsfield, New Hampshire bought the car. When Eli bought it, it had not seen the light of day for 50 years. Lost: Warren Dorrill's 1949 Ford 1949 Ford Club Coupe owned and restyled by Warren Dorrill of Gallup, New Mexico. Built over a span of two years, the car is also known as "The Shark." According to rumors, Warren's Shark is still around, and last we heard it was located in Tennessee. Warren's family are currently trying to locate the old family custom, and if possible buy it back. Lost: Ken McGoldrick's 1939 Chevrolet Coupe Marshall Tripp worked for Larry Watson at Watson's House of Style between 1966 and 1967. At the time, Ken McGoldrick was the manager in the shop. Kenny drove an in-progress 1939 Chevrolet custom that had been fitted with hydraulic lifts up front. Marshall never got to see Ken's car finished, and he is currently trying to locate Kenny and the Chevy. Rumor has it that Kenny moved to the Midwest about 5 years ago. Looking for Info: Justin Hocking's 1951 Ford In 2015 the mildly restyled Ford found its way to Australia. Dressed up with Barris Kustoms badges it came with a Certificate of Authenticity signed by George Barris. In 2015 George attended a car show in Sydney where the Ford was at, and George told current owner Danny Canal that he remembered the car and the works carried out on it. Since then the car has been sold to Justin Hocking of Melbourne. Lost: Gerald Twamley's 1954 Chevrolet We are very excited to announce that we finally have been able to trace Gerald Twamley's 1954 Chevrolet Custom to Colorado. Gerald was a member of the Long Beach Renegades car club, and he cruised the streets of Artesia in a Branson's Custom Shop restyled Chevy. Looking for Info: Augustus Eberman's 1941 Chevrolet Coupe This shortened, channeled and sectioned 1941 Chevrolet Coupe was owned and restyled by Augustus Eberman of Geneva, Wisconsin. Augustus worked as a development engineer for Oscar Meyer, and the Coupe is believed to have been designed by Brooks Stevens, who also designed the original Oscar Mayer Wienermobile. In October of 2016, Dan Tonielli bought the sporty coupe from an estate auction. 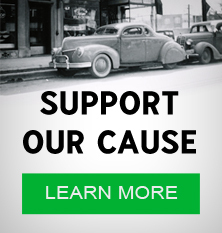 Lost: Reno Garcia's 1947 Buick Sedanet 1949 Ford Club Coupe owned and restyled by Warren Dorrill of Gallup, New Mexico. Built over a span of two years, the car is also known as "The Shark". According to rumors, Warren's Shark is still around, and last we heard it was located in Tennessee. Warren's family are currently trying to locate the old family custom, and if possible buy it back. Looking for Info: Mark Garza's 1940 Ford Convertible Who can help us identify this Mystery 1940 Ford Custom? Mark Garza of Nipomo, California bought the old custom from Arroyo Grande in 2015. Unfortunately, the seller, who bought it in Detroit, Michigan in 2008, had no knowledge about the history of the car. Can you help us? Looking for Info: The Spartanburg Mystery Sport Custom This is a 1941 Hudson-based Sports Custom that Niklas Lekman came across in Spartanburg, South Carolina. According to rumors, the car was originally built in California in the late 1950s! Do you recognize it? Lost: Norman Kopp's 1932 Chevrolet Coupe Norman Kopp's 1932 Chevrolet Coupe of Beloit, Wisconsin was originally owned and built by Norman's brother. The first running completion was in 1958, then the build was completed three years later. In 1964 Norman sold the coupe. He can't remember who he sold it to, or where it went, but for some reason, he believes it went to someone in Illinois. Lost: Norman Kopp's 1932 Chevrolet Two Door Sedan Have you seen this 1932 Chevrolet two door sedan lately? Norman Kopp is trying to locate his old high school hot rod. Norman bought the Chevy back in 1957, when he was a sophmore. He lived in Beloit, Wisconsin, and he was a member of the Road Gents of Beloit car club. Under the direction of his brother, Norman installed a 1952 Oldsmobile Rocket 88 engine, transmission, rear end and steering gear in the car. In 1962 he... Lost: Harry Hoskin's 1955 Chevrolet Harry Hoskins' 1955 Chevrolet was originally restyled by Barris Kustoms in the 1950s. Being a mild custom, the top on the car was supposedly chopped in the late 1950s to win top honors at a San Diego car show. In 1962 Jack Fox bought the car from a relative of Hoskins. Jack used the car as his daily driver for two years, before selling it off in 1964. Jack lived to regret selling the car, and a while back he got in touch with Kustomrama to see if we could help him trace his old custom.n! Glen's racer was constructed using various Ford-components, and the young kid from San Fernando, California won the Main Event that day. Looking for Info: Charles Marshall's 1950 Cadillac Roadster Back in 2000, when Charles Marshall, of Palo Alto, California, bought this sporty 1950 Cadillac roadster in Los Angeles, he was told that the car was supposedly built in New Jersey in the 1960s. The design of the car is heavily inspired by the 1953 Cadillac LeMans concept car. Charles is currently looking for info on his old custom, so please ket us know if you recognize it. In 2010 Kevin Hertfelder of Orange County bought the remains of an old Sport Custom. It was said to come from the Mid-West, but Kevin believes it has been around Southern California for a good portion of its life. Kevin is not sure what it started out as, but the best he can tell from the body and the steering wheel is that it started out as 1940 Nash, which was built into a two-seater. Joe Wilhelm's Wild Dream was never really lost, but original owner John Hernandez has kept it a hidden secret for the last 50 years. In June of 2017 John sold the car to Jeff Cimoli. Jeff told us that he heard about it trough a friend; "A friend of mine knew John's nephew. My friend didn't want it, so he told me about it, and I jumped on it." When Jeff bought the car it had been in storage for 50 years. John had been playing with it off and on, and even brought it out of storage for a show in 1999. Kenny Isaak's 1965 Pontiac Bonneville was restyled by Tom Chafin in 1967. Tom moved from Steubenville, Ohio to South Gate, California sometime around 1964. After building an award winning 1963 Buick Riviera Tom landed a job at Barris Kustoms in Hollywood. We thought the Bonneville, Tom's second build, was long gone, until recent photos of it surfaced in March of 2017. Don Holland's 1941 Ford convertible was restyled by Gil's Auto Body Works sometime between 1948 and 1951. In 1951 it gained national recognition when it was featured in Trend Book 101 Custom Cars. About the same time Don sold the car, and the family lost track of it. Don has passed away, but his family is currently looking for the whereabouts of the car. In the early 1950s Frank Layman ran a body shop in Pittsburgh, Pennsylvania named Frank's Garage. Frank specialized in custom car building, and one of his creations was a 1948 Packard convertible that he restyled for his own pleasure in 1953. The car was sold some years later, and Frank's son, Bill, is currently trying to find out what happened to his fathers old custom. John Svedberg of Vaggeryd, Sweden bought this nice little Roadster Pickup out of Castro Valley, California in 2012. He got it shipped to Sweden where he made it drivable and reliable. The original owner and builder of the car is currently unknown.. In 2015 Micke Hedberg of Borlänge, Sweden bought Delwyn Triska’s 1936 Ford 5-Window coupe. Delwyn bought the car in 1948 or 1949, and he had it restyled shortly thereafter. At the time he was living in Kagel Canyon, California. In 2013 Dewlyn passed away, and much of the history of the car went down into the grave with him, such as the name of the Long Beach customizer that chopped the top on the car. Ralph Tyrone Scarfo's 1950 Oldsmobile 88 hardtop was supposedly restyled in San Diego, California in the mid 1960s. In 2011 Ralph Tyrone Scarfo of North Bergen, New Jersey bought it from Southern California. The seller had only owned it for a year at the time, and he told Ralph that he had bought it from a friend of his who found it in a barn after about a 40 years hibernation. In 1967, Mark Mundorff of Lincoln, Nebraska bought a 1959 Ford Thunderbird from a dealer in Omaha. Powered by a Lincoln 430 engine and a 3-speed overdrive transmission, the race-ready Thunderbird had already been customized when Mark bought it, and the name "Avancier" was hand lettered on the driver's side sun visor. Mark still owns the car, and he has spent the last 10 years trying to find out more about it's mysterious past. In 1960, Eddie Dominguez of El Paso, Texas bought an already customized 1939 Mercury convertible from a local kid. According to rumors the car was an old custom that came from the San Diego area. 48 years later the car was advertised for sale at the Los Angeles Roadster Show. An older fellow who saw it at the show told the seller that a buddy of him had bought the Merc brand new from a Long Beach Mercury dealer. When did you last see a 1940 Mercury coupe with a 1955 Chevrolet grille? Virginia custom car enthusiast Roddy Moore is currently trying lo locate Virgil Shuck's 1940 Mercury custom. Built in Pineville, West Virginia in the late 1950s, the car wound up in a junkyard in Christiansburg, Virginia, before it was sold to Ohio in the 1970s or the 1980s. Gary Elmore Jr. is currently trying to locate his dad's old Studebaker custom. Gary Sr. was from Castro Valley, California, and he was a member of the Swanx of Oakland car club. He did most of the work on his car himself. It was completed around 1959-1960, and it hit the show circuit as the "Exotica". Charles McDonald's 1955 Ford Thunderbird was restyled by Don Roberts of Bear's Custom Body Shop after he moved his shop to Inglewood in the late 1950s. According to rumors, Don customized more first generation Thunderbirds than anyone else in the Los Angeles area, so it is good to finally see one surface. Charles McDonald's Thunderbird can in fact be the only know surviving Don Roberts custom car. This mildly restyled 1936 Ford was owned by George Patris, of Inglewood, California when he was a senior in 1945. His son, Michael is currently looking for the car. Last rumor he heard, was that the car was located in Glendale. Do you know anyone in Glendale that might own George's old high school ride? In the early 1980s Red McCormick of East Hartford, Connecticut bought an old customized 1955 Chevrolet from Durham, Connecticut. Red sold it to Barry Atkins, who restored it and restyled it further. Today the car is owned by Marc M. of WIttmann, Arizona. Rumor has it that the car was first restyled in 1958, and Marc is currently trying to find out who the original owner and builder was. Do you know this car? Back in 2011 we added John Sak's Third 1941 Ford Convertible, Barbie, to the Kustomrama Lost and Found section. John, who built the car between 1957 and 1960, ended up selling it in the 1970s. Being a 1941 Ford fan, he soon regret that he had sold Barbie. After spending nearly 40 years trying to locate it he turned to Kustomrama for help. It took almost 2 years, but in September of 2013 we finally found Barbie. In 2010 we ran a featured story on Gary Heliker's 1926 Ford Model T Roadster. Back then nobody knew where the car was, or if it was still around. Even Gary Heliker mailed us to inform that he hadn't seen or heard the car since he sold it in the 1960s. Mike McHenry of Apple Valley, California knew all the time, because he bought the car in 1997. In September of 2013 Mike wrote Kustomrama to share the news. In the early 1960s, Robert "Doc" Albers of Lakewood, Ohio got a sectioned 1949 Ford from his dad. The car was originally restyled by Milton Depuy of Cleveland, Ohio around 1956, and when Doc got it, it had no motor. Doc got the old custom back on the road again, and he drove it for a while in black primer before he sold it to Russell Standish in 1964. Since then it has disappeared, and Doc is now looking high and low for his old car. In 2012 Josh Haagen of Bangor, Maine bought an old custom built Buick boattail roadster that had been left abandoned behind a building. He was told that the car was originally built in Berwick, Maine. Josh, who is a body shop guy, believes the car was once completed, run on the road, and disassembled for a restoration that never happened. Josh is currently looking for info on his car. Do anyone recognize this one-off creation? Harold Agresti's 1951 Cadillac Series 62 Coupe was restyled in the San Francisco Bay Area around 1956/1957. The look of the car was upgraded by installing a 1954 Cadillac front clip. It was then nosed, decked and shaved for handles. Harold Agresti of Turlock, California bought the car in 1958. After selling the car locally, the Cadillac was eventually sold off to Arizona in the early 1960s. Do anyone know anything about the whereabouts of Harold's Cadillac? Some new leads on the Jack Nethercutt's 1952 Oldsmobile has come up, as San Jose Rod and Wheelers member Lenny Macchiarella claims he saw the car advertised for sale in the Auto Trader in 2000. It was still located in El Cajon, and it had been painted white. Lenny tried to buy it, but it was already sold. Anyone else remember seing a 4 inches chopped 1952 Oldsmobile in the El Cajon area about 12 years ago? In 1958 John Sak of Syracuse, New York set off to restyle his 1941 Ford Convertible. Main modifications included a chopped top, reworked front, molded fenders and custom upholstery. The build was completed in time for the 1960 Syracuse Autorama where John wan a first place trophy with his build. He sold the car in the 1970s. It was restored again in 1983, and finally sold to a guy in New Jersey. John would really like to buy his old car back, and he is currently looking for its whereabouts. In 1964, John and Rebecca Hackler bought their first car, a customized 1958 Chevrolet Impala, in the Monterey Bay area in California. The car was advertised for sale at a used car lot, and the seller told John and Rebecca that the car had been restyled by non other than Bill Cushenbery. Does anyone recognize this Impala? Is it a real Cushenbery custom? And where is it now? The Gardner Special was designed and built by famed automobile designer Vincent E. Gardner of South Bend, Indiana. Vince, who worked under Raymond Loewy at the time, bought a brand new 1947 Studebaker Champion that he based his sportster build on. Luckily the car is still around and Vintage Motorsports and Arrigo Specialty Metalworks is currently restoring the sportster back to its initial version. Last year, before we started the Lost and Found section on Kustomrama, we wrote about Wayne Graefen, who was looking for the Vlk Family Custom in one of our Kustomrama Newsletters. Wayne, who first saw the unique coachbuilt Spohn car as a kid in 1957, has spent 54 years of his life hunting for the car. July 8, 2011 he found it, and four days later he had become the proud owner of his life-long dream car. Jack Nethercutt, the President of the Nethercutt Collection is currently looking for the whereabouts of his old Barris Kustoms restyled 1952 Oldsmobile. The car has not been seen for years, so any leads are appreciated. 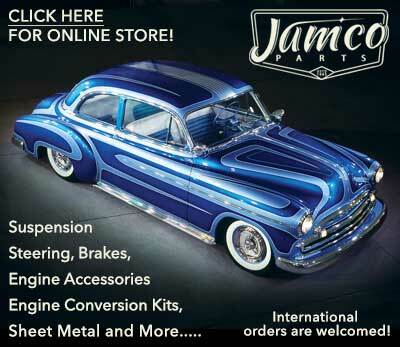 Jack bught the car in 1953, and drove it directly from the Oldsmobile dealer to Barris Kustoms. Jack sold the car, and we know that it was owned by Ronnie Smith of El Cajon, California in the early 1960s. In May, 2011 the remains of the original Lil Bat by Bill Hines was advertised for sale on Craigslist. Bill sold the car in the early 1960s, and as the new owner wanted his own version of the Lil Bat, Bill restyled the car beyond recognition. The build was never completed, and the car sat outside in the Michigan wilderness for several years. The car was luckily sold to a genuine enthusiast, and I look forward to see what he does with this survivor. This 1955 Ford custom is currently owned by Paul Schneck of Anoka, Minnesota. Paul bought the old custom from a friend in 2007. Paul's friend got the car to update it for a customer with a new running gear. The current owner had bought the car at an auction at the Minnesota State Fair Grounds more than 20 years earlier. Paul is currently looking for more information on this old custom, so if you know anything about it we would like to hear from you. 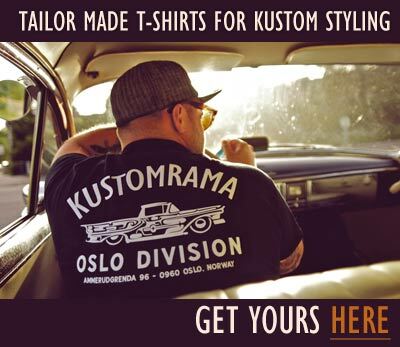 Subscribe to our newsletter and receive updates on Lost and Found and other subjects featured on Kustomrama. If you have additional information, photos, feedback or corrections about Lost and Found, please get in touch with Kustomrama at: mail@kustomrama.com.